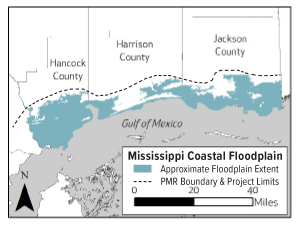 The Federal Emergency Management Agency (FEMA) completed a riverine and coastal flood hazard analysis for Hancock, Harrison, and Jackson Counties in 2009, resulting in the adoption of the Digital Flood Insurance Rate Maps (DFIRM’s) for these three coastal counties. Mississippi was one of the first communities to adopt the DFRIM’s following FEMA’s Map Modernization initiative. Since becoming effective, there have been a multitude of changes to the coastal landscape. In addition, there have been substantial technological advances in the development of hydrodynamic numerical models and mapping, along with newer and more accurate sources of data. In 2016, the State of Mississippi, through the Mississippi Legislature, appropriated funding for the development and modernization of the DFIRM’s for Hancock, Harrison, and Jackson Counties to more accurately reflect the landscape of the Mississippi Gulf Coast and utilize the most current scientific and technological improvements available. The Mississippi Coastal Map Revision Project (MCMRP) is a grassroots movement, where the State of Mississippi is bearing the responsibility for the preparation of the Physical Map Revision (PMR) in accordance with guidelines established by FEMA. Since late 2016, the Southern Mississippi Planning and Development District (SMPDD) has been engaged in the administration and implementation of the MCMRP. During this time, SMPDD hired a lead Technical Advisor, whose experience and knowledge of FEMA’s flood mapping program will ensure the program remains on track and in accordance with FEMA regulations. SMPDD mounted a robust Discovery Phase for the MCMRP. Outreach meetings have been conducted with each of the impacted local communities, including the Native American Tribal Nation, to gain local support for the program and specifically identify recent improvements to the coastal landscape in their respective communities. Local leaders have shown overwhelming praise and commitment to provide continued support throughout the PMR process. SMPDD has engaged the Mississippi Congressional Delegation and is currently coordinating with FEMA’s Region IV in Atlanta, GA to request funding allocation for the review and processing of the Intermediate Data Submittals for the MCMRP. SMPDD has selected Michael Baker International, Inc. in partnership with Arcadis to lead a team of highly specialized professionals in the development of up-to-date flood maps for Hancock, Harrison, and Jackson Counties. The Michael Baker and Arcadis team provides SMPDD with a complete professional resource for all the components necessary to complete a coastal PMR, including discovery and outreach support, base mapping data development, topographic data acquisition and processing, coastal flood risk modeling, DFIRM development, post preliminary processing, and expertise with multi-stakeholder outreach and public involvement. The Michael Baker and Arcadis team is composed of experienced local individuals and nationally recognized experts that offer world class flood modeling skillsets. In every area of the study, SMPDD will be supported by professionals who are not just experienced but recognized national leaders. Michael Baker has been providing engineering services in the State of Mississippi for the past 70 years and brings unrivaled experience in FEMA coastal flood risk analysis program and mapping and provides decades of foundational relationships with FEMA Region IV and Headquarters staff, up to the highest levels of the organization. Since 2009, the Michael Baker team has performed or provided a formal FEMA review for every coastal study produced in Mississippi, Texas, Louisiana, Alabama, Florida, South Carolina, and North Carolina. As a leader in flood hazard modeling/mapping, risk assessment, hazard mitigation, disaster response, floodplain management and water resources planning, Michael Baker has provided these services to local, state, and federal clients for over four decades. Their hydraulics and hydrology, mitigation, and flood plain mapping staff are recognized national industry experts. Arcadis is a leading global design and consultancy firm for natural and built assets with a long history of constructive, collaborative relationships with FEMA, working to produce the highest quality flood hazard information for communities. Arcadis has developed a reputation for working constructively with FEMA Headquarters through several appeals and subsequent remapping efforts in Region II. Recognizing their unmatched expertise, FEMA Region IV sought out Arcadis to support their PTS Alabama and Florida Panhandle studies. Renowned for the size and complexity of their world class projects, they combine a deep knowledge of local conditions with fresh global perspectives for unique, integrated solutions. From planning and modeling studies, like this effort, through implementation and maintenance, Arcadis is all about balance between the creative and the functional. The Michael Baker and Arcadis team has tapped Machado-Patano Design Group to assist with field reconnaissance and data analysis. Machado-Patano Design Group (Machado) is a multi-disciplined engineering firm headquartered in Biloxi, MS, with a local knowledge of the Mississippi Gulf Coast and capabilities in performing surveying and mapping that are true assets to the Michael Baker and Arcadis team. Machado has compiled over 40 years of surveying history and data along the entire Mississippi Gulf Coast. The large database and technologically advanced surveying equipment used by Machado allows them to be extremely proficient and knowledgeable in this key aspect of the project. Using the most advanced technology, including GPS, LiDAR, drones and ATVs, Machado delivers efficient surveys with the highest accuracy available in the field.